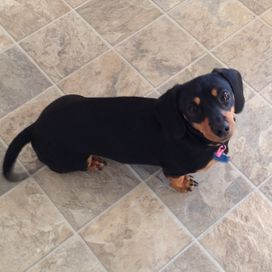 "Thank you to Kris at Ministik Hills for helping me teach my puppy to be a well-behaved member of the family. 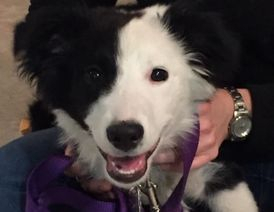 We joined Ministik's Puppy Kindergarten when Sydney was just 4 months old and it taught Syd and I how to communicate with one another, to build Syd's confidence, and to keep her mentally stimulated. Developing a circle of fur-friends and learning how to interact appropriately with them was an important part of the time in class, too. Kris sent us home with information so we could continue to learn between classes and develop the bond I wanted with my dog. The difference between day 1 and graduation day is astounding! Thank you, Kris, for giving me the sweet, loving dog I knew Syd could be!" "Our dog Ellie was showing signs of separation anxiety so we signed up for private sessions. Kris came into our home and worked one on one with us and Ellie. We were able to greatly reduce Ellie’s anxiety and Kris taught us so much more. We now have a dog who we are comfortable taking anywhere and we couldn’t be happier!" "My fearful dog has improved significantly. Before she was nervous, scared, fear aggressive, and scared of diesel engines. After 4 sessions over 8 months, Kris was able to help me understand my dog's behaviour better and explain why I should use certain methods. For instance, I believe in the Cesar Milan method, but understand that is not a successful approach for a fearful dog. Instead, she needed to build her confidence and learn to be calm. As a result, Shiraz is less nervous and happier! I continue to work with my dog as fearful dogs are the hardest to change because of the unpredictability; even more than an aggressive dog. I have learned a lot about dog behaviour and will help me be more confident with my dog. Thanks Kris. Big licks from Shiraz!" "I have had a very pleasant experience with training my dog Marley. 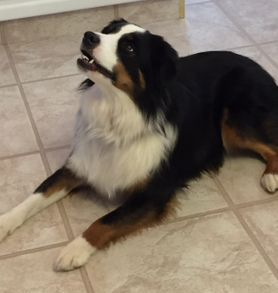 He is a very happy and busy 2 year old Australian Shepherd. Kris has given me lots of confidence in teaching him new tricks to keep him mentally stimulated. Kris is full of great knowledge and truly does have a connection with animals. I look forward to continuing the work with Marley and growing closer with him." "I, along with Maggie a rough collie puppy, had the pleasure and privilege of studying obedience under Kris Rooney. 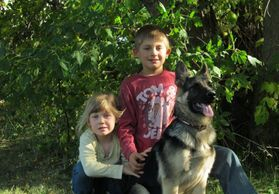 We offer our endorsement of Kris as a caring and skilled dog training professional. Kris is gifted, watching her work with dogs will lead you to this conclusion. She also excels on a second front, one of equal importance. Kris knows how to teach people. Kris is a former teacher, and from that experience Kris has learned to articulate, demonstrate, motivate and inspire her students. Through friendly and logical methods and strategies, she makes you believe that you can ‘do it’ and then shows you that you can. Under Kris’s direction you will find your dog doing better, doing better faster, you will learn to correct yourself, analyze your own performance, exceed your expectations and above all enjoy the experience. We look forward to working with Kris on advance training soon." Exciting news flash from Heidi! "I was walking with Heidi on the road off leash tonight and noticed the cows were out. Lyle noticed from the house and was driving in the field where they were. Heidi and I practiced "front" a lot and she did not once offer to run to the cattle or chase them. She sure watched them but did not leave me. I was very excited! Thank you so much for your help. I am really enjoying it!"